I know that's a bold title. 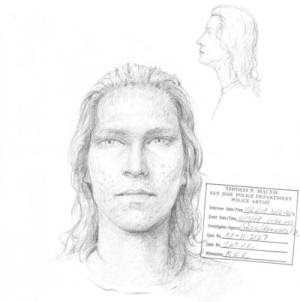 For the last few days I have been doing interviews and answering the question of whether or not I'm hopeful about the latest lead, which is that a guy named Loren Herzog may have killed Michaela, and another guy named Shermantine, might know where she is buried. And of course I have answered that this is not what I'd consider a "hopeful" lead, since it would mean that Michaela is not alive. 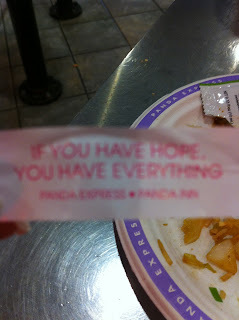 I know what "hope" is, because I've been hauling it around for a long time. It has, in truth, been a pretty heavy load to carry, but I am not ready to put it down because convicted killer Shermantine has said that his buddy Herzog resembles our composite. I am going to continue to believe that there is every possibility that Michaela is still alive until it is proven beyond a shadow of a doubt that she is not. Yesterday, I got an e-mail. I'm going to be deliberately vague about this, because I don't want to compromise the investigation in any way, and I would not want to compromise anybody who was kind enough to give me information about Michaela, and I would not want to endanger Michaela. But this e-mail was sent from outside the United States, and it very briefly named the country that Michaela is in (not the one the e-mail was sent from), but said that she "has changed too much to remember." And of course, this is something I would believe. Maybe this is just my heart longing for it to be true, but there was just something here that spoke to me. In the early years after Michaela was gone, I had a repeating dream. I must have had it at least 20 times, each time exactly the same. In the dream, I was walking through the streets of a town in a foreign country, and I would come to a house and enter into it. I'd go into a room which I knew was supposed to be my room. It was sparsely furnished, felt emotionally cold, and I felt so lonely. Then someone would call that it was meal time, and my spirits would lift, thinking that there would be other people at the meal and perhaps I wouldn't be so lonely. I'd go into the dining room, and there were other people there, but they didn't talk to one another -- they were like perpetual strangers, and my loneliness deepened even further. I know that this dream could have been merely a reflection of my own psyche, quite fractured at that point of course. But I had this same dream so often I couldn't help wonder if it was trying to tell me something, and specifically if it was a message from or about Michaela. When U.S. troops went into Iraq, I found myself having fantasies that one day a blonde, blue-eyed girl would walk up to one of them and say, "Can you help me get home?" There was another very compelling lead in Michaela's case that had placed her, alive, outside the United States, back in the early years -- and in the company of another missing child. That lead was not about the same country as this e-mail, but if this is what happened to her, then she would be a part of something not really heard of back in the 1980's but now a quite popular cause -- not just kidnapping, but human trafficking. What various routes that might have traveled through to go from this place to that is anybody's guess. At any rate, following up on leads like this is not easy. There was no specific location given, just a country. There is no door to go knock on. More to the point, it said that she had changed too much to remember. Before you start sending suggestions, as well meaning as they may be, I want to let you know that we are a very smart bunch of people working on Michaela's case here, so we already thought of that. ;) But I have to do what I have to do, and you know that what I have to do is to try to reach out to Michaela. And I am asking you to please help me by spreading word of this blog worldwide. If you have any friends, relatively, or acquaintances in countries outside the U.S., please, please ask them to start regularly posting links to this blog on their social networking media sites. Perhaps it might be helpful if I named the country this man gave me, but there is always the possibility that this man was wrong, that the person he is thinking about is not Michaela, but she could still be alive in some other country. So please, please help me to blanket the entire world with news of Michaela. Let me letters to her pour into the four corners of the world and overflow into all places in between! Please! If Michaela is out there, if she has forgotten, let's help her to remember. I even looked up instructions on how to dial into the United States from outside the country, and I have posted those instructions for Michaela at the top of the sidebar here in this blog. Honestly, I have to wonder why I never thought of these things before. But perhaps that is just a matter of everything in its time. If you have been reading my blogs for awhile, you have probably heard me say before that I thought Michaela would be found in 2012. My reasons for believing this are a combination of intuition and astrology. The primary transit that made me think Michaela would be found in 2012 is transiting Pluto conjuncting my natal Sun. Pluto transits are long, going back and forth over a point for approximately a year and a half. A few years ago, Pluto transited my natal Mercury by conjunction. The energy of Pluto is like atomic power, and death and rebirth, and Mercury is of course communication. I wasn't practicing astrology at that particular time, so I had no idea this was going on, but during the long period of Pluto's dance over my Mercury, I started getting these ideas. 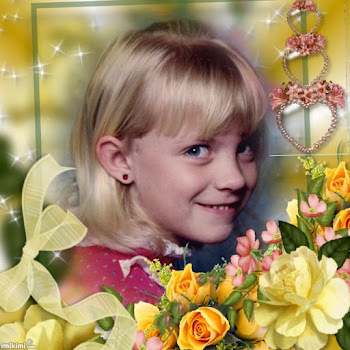 First I wrote a child safety book, and then I decided to make a website for Michaela, and then after so many years of relative quiet in Michaela's case, America's Most Wanted said that they wanted to come out and do a story on her. But then on the very day of Pluto last exact conjunction with my Mercury, Jaycee Dugard was found. And with that, there was a veritable nuclear explosion in the communications division of my life. It seemed as though all day every day, from 3:00 in the morning until 9:00 at night, I was being called upon to do interviews both here and abroad. 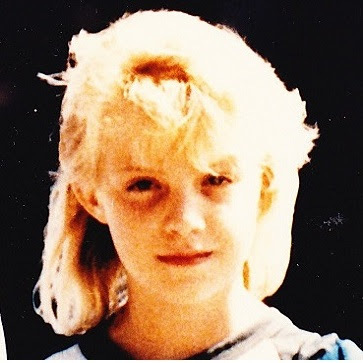 Michaela's fame rose to proportions even higher than in the days after she was kidnapped. And there I had a website all prepared. I had business cards printed with the website address and my e-mail address and phone number, every bit as though I'd known that all this was going to happen. Except, of course, that I hadn't know. But the Universe had, and had prepared me, and had put in place a little infrastructure for all this attention to fall back on. My little website was getting 6,000 hits a day! Just last week Pluto moved onto my Sun for the first time, coincidentally just as I started to receive the first calls about Shermantine and Herzog. And even though I don't think Herzog is the answer, I think that it served to stir the pot to bring to the surface things that might eventually lead us to the answers. 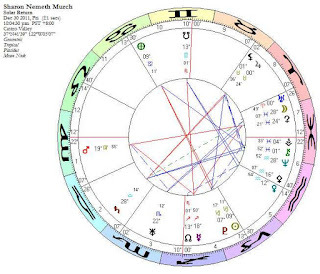 This is going to be a long transit of Pluto over my natal Sun, but when I hung up from that first call, I found myself whispering, "And so it begins...."
One of the reasons I believe that Michaela might be found alive is because I ran both of our Solar Return charts. Those are charts run for the exact moment each year when the Sun reaches the exact degree it was at when you were born. 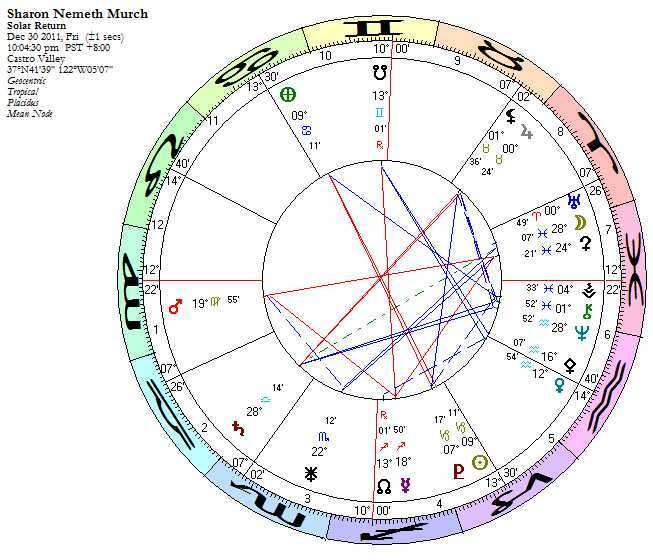 I will copy Michaela's and my solar return charts here for you to see. 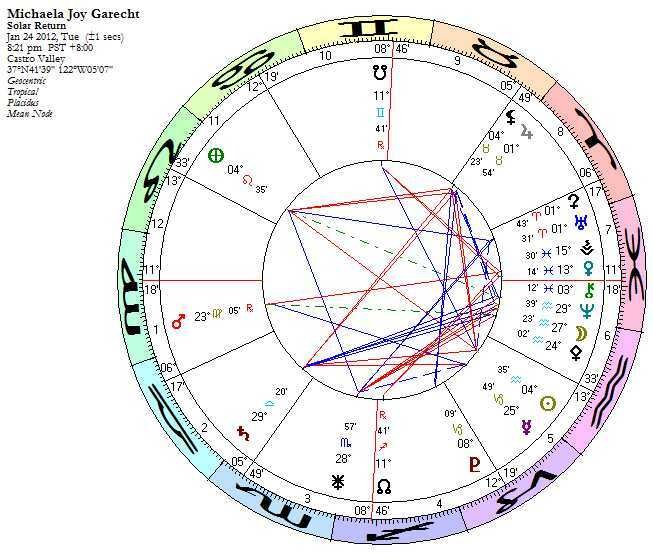 You don't have to be well versed in astrology to notice that there is a great similarity between the charts. The house cusps match each other almost exactly, and a significant number of the planets are in the same houses. 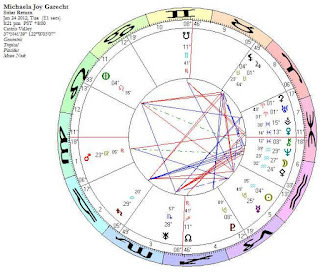 These solar return charts also closely mirror Michaela's birth chart. Her natal ascendant is 9'40" Virgo, while the solar return ascendant here is 11'18" Virgo. This to me indicates a sense of coming home to herself. Now I have no idea whether or not the natal chart remains active after death. I don't know if 23 years after death a solar return chart would indicate remains being uncovered. It's not impossible, I suppose, but to me it just seems far more likely to indicate a living person. And in both her chart and mine, the North Node, which is the dharma or forward path, is on the 4th house cusp, or bottom of the sky, which is the home, family, our roots, together. Last weekend, just before Michaela's birthday, just before all this started happening regarding her case, I spilled copious amounts of water. Okay, I have a natural inclination to superstition, inherited from my Irish grandmother, but in one moment I had dumped an entire pitcher of water onto the kitchen floor, and within a matter of a couple of hours, I had stepped in the dog's water bowl and had spilled it all over the floor. It was just too dramatic, coincidental, and really unusual, so I had to google the meaning of spilling water, and I found that it is done to symbolize good luck! Today at work, I went out to move my car (two-hour parking in the neighborhood), and I found a pine cone right by my car. I looked all around and there were no trees anywhere near that might have dropped a pine cone, but there it was. And a pine cone is Jaycee Dugard's symbol of freedom. A pine cone was the last thing she touched before she was dragged into the Garridos car. I have adopted this symbol myself in the pine cone necklace I purchased from Jaycee's Foundation, and which I have worn 24 hours a day since receiving it. I picked up this stray pine cone from the sidewalk and took it back to my office, and I had to be struck by its symbolism, particularly on this day. I've talked to a number of people about this today. Of course there have been those who have felt it necessary to try to dampen my spirits. Why do they do this? If they are trying to "protect" me, I don't need protecting. I know absolutely full well all the reasons why this might not be true. But I feel it to be true. I see it being true. If it isn't, then I will live, just as I've lived through everything else in these last 23 years. And in the meantime if it has done nothing else but give me a few days when hope lifts me up instead of dragging me down, then let me have that! I believe that everything that happens has its purpose in our lives. If this lead does nothing more than provide the motivation to spread Michaela's story throughout the world in hopes of reaching her, then that's a pretty great thing. So I ask you to please, please help me to spread Michaela's story, to call her name and hope and pray that she will hear and answer. To all of you, thank you. To the person who wrote me the e-mail, if you read this blog, thank you, and I do wish you would write again and tell me more. To Michaela, I am not giving up on you, not ever. You may not remember clearly, but I know you haven't forgotten all, and if you read through this blog I know it will help bring everything back to your mind. We love you, Michaela. I do, your family does, and these hundreds and thousands of people throughout the world who have never even met you love you and pray for you and wish for your safety and your happiness. Please, just pick up the phone and call me. Wherever you are, just tell me, and I will come and get you and bring you safely home. We are all hoping with you, Sharon. It is not up to us to decide what happened to Michaela if we don't know! Sharon, I have posted to you a few times. I have to tell you, I may not every day, but more times than not, I include you and Michaela in my prayers. I pray to God to lead you to her. Lately, I have been amazed about the many times God has answered my prayers. 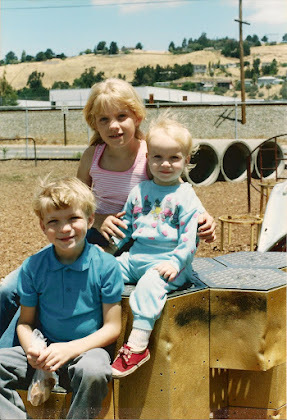 Recently, one of those miracles was God protecting my children. It was snowing heavy a couple of weeks ago here in Illinois, and my 17 year old son, who had virtually little driving experience in the snow, drove his brothers and best friend home from school. He had his first car for literally 10 days. As he approached the turn to the road that leads to our house, he started sliding towards a car, that just happened to contain a teacher who was once his brothers special needs teacher at school. Not only did they not hit her, but they missed a stop sign by literally inches and dropped down a 15 ft, heavily lined with tree ravine. If I were to post the picture, it would appear that the car literally had one perfect landing, and the car had taken it. They hit nothing, and they weren't injured, and $125 dollars later, the car came out of the ravine untouched. What is remarkable is that I was praying at my desk at work to guide him and his brothers and friend home safely. Just so happens, he was praying the exact same thing at the same time. So, this leads me to Michaela. I have been praying for you and her, and the other day when I opened your blog, I knew in my heart there would be new news. What I didn't want to see is that it was about finding her this way. However, perhaps it is a catalyst for an unfolding you seek and need. It just helps spread the word you have never forgotten her, and it reaches to Michaela where she lives, and opens that door to her heart and memories. I so pray 2012 is the year of Michaela. Like you, I feel it is. 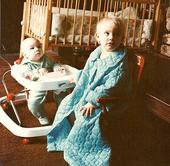 PJ I am so glad your kids were safe, and thank you for your prayers. i am with the man above. only I wish i knew someone abroad too :( Love you Sharon. You will find her one day hopefully in 2012. You and your family are in my prayers all the time. 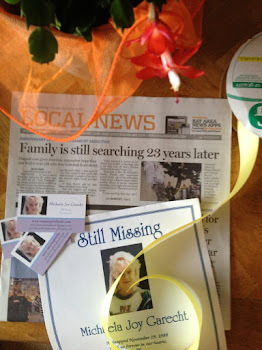 I agree with you that Michaela will be found in 2012. 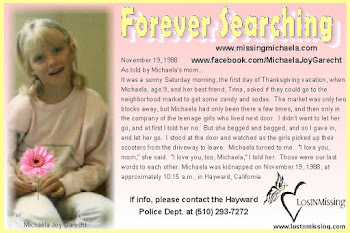 My 13yr old granddaughter and I held hands at Christmas time and prayed, cried, and agreed in prayer for Michaela to be found in 2012. We both felt deeply this will happen. I believe in prayer and miracles and I know God is working in this. I will never, never, loose hope for Michaela. Sharon, I pray for God's miraculous strength in your life through all of this. I have friends in the Philippines and will have them spread this around. Have you thought of getting a twitter account? it is an excellent way to spread the word world wide. I would send messages to stars with big followings along with news outlets and ask them to retweet your blog address..
Never underestimate a mothers intuition. Keep hope alive. Everytime I read these I want to bawl...I dont know you do it, but you do...I was think ing you could always try posting an ad on some of the Craigslist from other Countris, like in the Rant and Raves sections...I dont know how you do it, I know I would not bee that strong. Peace. I agree on keeping up with the tweets on twitter... I think it is more popular internationally. I know someone who got an international book deal recently just based on her constant "tweets". Have you ever considered that she may speak or read a different language now? If she left behind/forgot her identity.. couldn't she have left behind her native language as well? Would there be a way to inexpensively spread the word on the web in other languages.. could you use babelfish or something? I'm not sure how US authorities spread the word about these matters overseas. 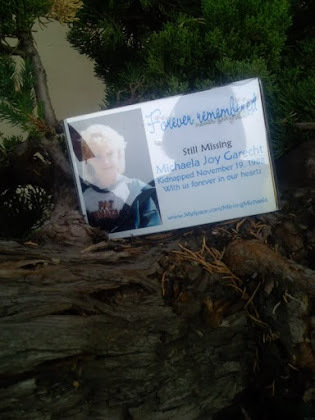 Dear Sharon, I will be spreading Your messages for Michaela (your blog, website, fb and Michaela's poster) around south africa and some other African countries where I know a few people. And I also know some people in Australia. Will send it to them too. You are so right. We never know who this might reach. Someone Somewhere HAS to know Something. Brainiac, I would hope that having spoken and read English for the first ten years of her life that if she came across it she would still be able to. I mean, you never forget how to ride a bicycle, right? But when I was researching the message I received, I came across a number of websites that were not in English, and whenever I did my browser asked me if I wanted to translate them into English. Hopefully that also comes up in other countries as well. I'd think it would. no Sharon,unfortunately it doesn't come up like that in other countries.if a website is in a foreign language then the browser will ask you if you want it translated to English.that's all.but if you are in Russia opening a website that's in English it doesn't ask you if you want it translated to Russian.as much as we would like it to be technology is not that developed. The technology is there to translate from English to other languages, just as it is to translate from other languages to English. But it's not very good. It's okay for a couple of words or a phrase, but not for any substantial prose. To all those who are suggesting Twitter as a good outreach, DO IT! I do have a Twitter, but don't use it much and don't have a lot of followers. But if you tweet this, and ask everyone who reads it to re-tweet it, then it will get out there. I can't do this alone, so if you have a good idea, please JUST DO IT! I will add this to my fcbk page and am always praying for Michaela and read your updates nearly daily . God is in this. He loves her. He made her for Him. I have friends in England (my home) and here in Canada. Sharon: I work in a title I school with a lot of Mexican immigrants and I've seen that after about 2 years if the child is in a full submersion environment, they lose their knowledge of Spanish. If you don't use it you lose it kind of thing.. so it was just a thought. I am sure her pictures would spark more emotion in her than words anyway! I will spread the word and her pictures as well! I'd be surprised if you find any kids in a full submersion environment, because I'm sure their families still speak their native languages at home. I am an immigration paralegal, and I work with many people who have lived in this country for a long time. Many remain uncomfortable with English even though they are completely fluent, but I haven't run across anybody who has forgotten their native tongue, even after having been here for more than twenty years. I do think Michaela would still remember English, even if she had to have that memory jogged by seeing it. But there is no way I can translate my blogs into other languages. As I said, my browser offered to translate foreign language websites for me, and when it was straight information there wasn't a problem, but when it got into prose, the ability of a bot to translate is severely limited. And I can't employ people in all different locations to translate my blogs. However, people CAN post them on their social networking websites with introductions in their native languages so that if she saw it she would know what it was about. I hope and pray Michaela is found safe and brought home. I have great respect for all you have done to keep her story alive, and I really hope 2012 is the year she is finally found. You are in my thoughts.